It being the last Friday before a holiday I thought of all the parties and general goofing off that goes on today and so in that spirit I give you a site that more people have sent me than I can imagine. 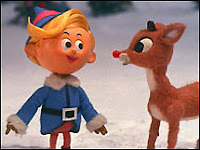 Elf your Self is a site that is similar to JibJab. It allows you to upload some pictures and have them be part of a singing dancing holiday card. It is fun to do and you might as well because you most likely not getting work done. So why not produce a masterpiece of elfness? Give it a try.